Are Your Words What God Expects to Hear? Words! They are powerful. God spoke the entire world into existence with words. Words can build up and they can tear down. 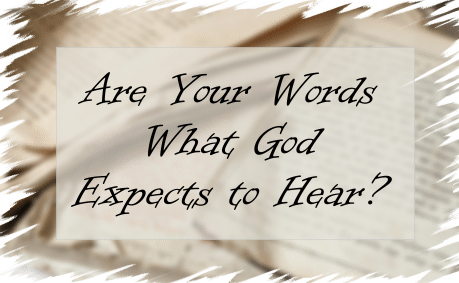 The question I have for you: “Are your words what God expects to hear”? There are plenty of guidelines and examples in the Bible to remind us of what God expects and expects not to hear from His children. Here are just a few. Words of evil men are often enticing, flattering, hasty, irritating, irreverent, insincere, malicious, proud and vain. 1 Thessalonians 2:5–6 For neither at any time used we flattering words, as ye know, nor a cloke of covetousness; God is witness: Nor of men sought we glory, neither of you, nor yet of others, when we might have been burdensome, as the apostles of Christ. The conversation of those that call themselves Christians includes not only the words that they use, but also the way they conduct their life in general. These words and conversation are right, pleasant, appropriate, gracious, inspiring and unforgettable, wise, comforting, glorifying to the Lord, and timely. Psalm 145:11–12 They shall speak of the glory of thy kingdom, And talk of thy power; To make known to the sons of men his mighty acts, And the glorious majesty of his kingdom. Luke 24:30–32 And it came to pass, as he sat at meat with them, he took bread, and blessed it, and brake, and gave to them. And their eyes were opened, and they knew him; and he vanished out of their sight. And they said one to another, Did not our heart burn within us, while he talked with us by the way, and while he opened to us the scriptures? Ephesians 5:19–21 Speaking to yourselves in psalms and hymns and spiritual songs, singing and making melody in your heart to the Lord; Giving thanks always for all things unto God and the Father in the name of our Lord Jesus Christ; Submitting yourselves one to another in the fear of God. As Christ-followers, we are called to share the good news of the gospel with all nations. When your life reflects the words and conversation that God expects from you, more people want to have what you have. Put good words into action and know what God expects from you. When you became a child of God old things passed away, all things became new (2 Corinthians 5:17) but the only way you can change old habits are to replace them with new ones. Spend time in His Word daily and your mind will be renewed by the Word (Romans 12:2). That’s a good thing! Something more for you to read: How Can Christians Be Holy? Hi. Would you please explain Proverbs 25:11 to me? Thank you! I’ve heard it countless times but never understood. Words expressed who we are and how much we can speak about God will in our lives. So spread the word of his eternal Life that He offers by Faith only. Previous post: How You Can Identify False Teachers Or Pastors In A Church? Next post: What Does The Bible Say About Knowledge?